A man accused of slitting his fiancée’s throat was refused bail yesterday to protect the main “vulnerable” witness - his son. 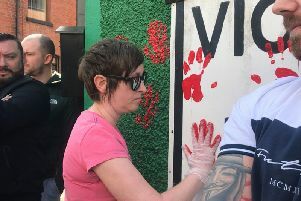 Craigavon Magistrates Court heard the alleged circumstances surrounding the death of 51-year-old Anita Downey in January. Her partner David Lyness, also 51, is charged with her murder on January 20 and he unsuccessfully applied for bail. A detective constable described how Lyness’ son made a 999 call, saying “his father had slit his girlfriend’s throat”. “He had ran from the home because his father had threatened him,” said the detective, outlining that the caller also told the operator the couple had been “arguing” and that his father had “pointed the knife at himself and said he was going to kill himself”. The detective adding that when officers arrived at Lyness’ house in Lurgan, Ms Downey was lying in a pool of blood on the floor with “an open wound to her neck”. Refusing bail, District Judge Bernie Kelly revealed Lyness had 25 previous convictions and that she shared police concerns over the main witness and that the alleged killer “was at risk of harming himself”. DJ Kelly ordered him to appear again on May 5.